Now One Foot, Now the Other was one of Basbusa's own selections at the library, and again, it's one I would never have chosen for her. It's about a boy and his grandfather, who have been very close ever since he was a baby. Then the grandfather has a severe stroke. The rest of the book deals with the boy's sense of loss, then his fear when his grandfather comes home again but cannot walk or talk, and then finally, how the boy's love for his grandfather helps the grandfather to recover his health. 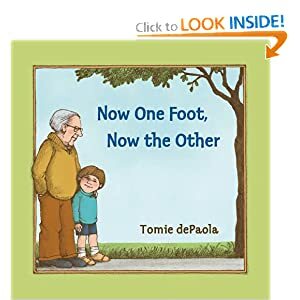 (The title of the book refers to how the grandfather taught the boy to walk when he was a toddler, and how the boy teaches his grandfather to walk again after his stroke.) 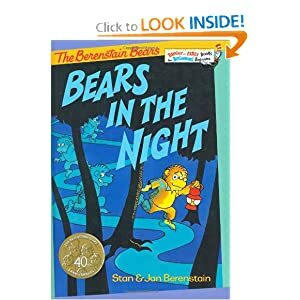 It's the kind of book I would never have gotten unless a child needed to understand about strokes due to their own circumstances, but actually Basbusa really enjoyed it (?!?). She didn't seem to find the plot alarming, and we actually had several meaningful chats about aging and illness and the ways in which love can and can't cure things. Almost done with my giant backlog of un-blogged books! Two more posts should do it, I think. 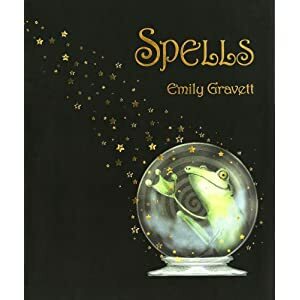 First up, Emily Gravett in general, and Spells in particular. The basic plot is that a lonely frog decides to transform himself into a prince so that he can marry a princess and not be lonely any more. But since he has been tearing sheets out of the spell book to make palaces and pirate-ships, he has to try to piece all the paper back together again to get the right spell. From then onwards, the book is literally split in two, horizontally. You take your pick of any page from the top half and any page from the bottom half, and you end up with an animal that is half one thing and half another, with the spell to go along with it. For example: "String thing / forked tongue / Alakazird / SNIRD! ", along with a picture of an animal that is half snake and half bird. Basbusa thought these were absolutely hilarious. We read them over and over and over and over, and she never got tired of it. We tried many other Emily Gravett books as a result, and she liked many of them (Blue Chameleon and The Odd Egg, for example), but I think she was still a little young for most of the others. 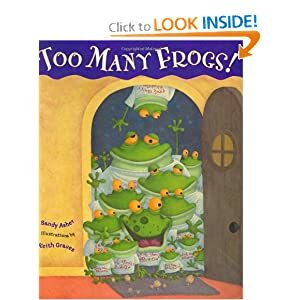 Too Many Frogs is another funny story dealing with unintentionally-caused chaos, but here the "chaos" is the disruption of an unsociable, book-loving Bunny's bedtime-story routine. A cheerful and very outgoing frog discovers this regularly-scheduled story time, and - much to the disgruntlement of the bunny - makes a habit of arriving just in time for each night's installment. When the frog arrives with his entire family reunion in tow, the bunny finally speaks up and declares that he likes his story-time alone... only to discover, when he gets his wish, that he has actually come to enjoy having such an enthusiastic listener for his stories. A very enjoyable read, even if it's not imparting any particularly profound truths! 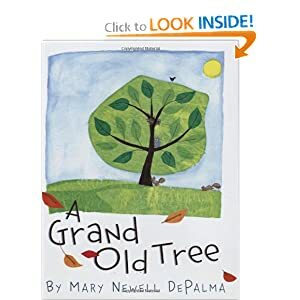 A Grand Old Tree is more non-fiction than fiction, although it's told in picture-book fashion with a tree as the main 'character.' It simply describes the life of a tree, through the various seasons and through all kinds of weather. Eventually, the tree dies and falls down, but even on the ground it continues to 'participate' in the world of living things around it, and its descendants have spread far and wide. This book is absolutely not giving any kind of formal 'instruction' about life cycles or ecosystems, but I really liked how it introduced those ideas through the simplicity and the beauty of the rhythms it was describing. (The tree in the spring gave shelter to birds and animals, and the dead tree on the ground still gave shelter to animals and insects, for example.) This was one of Basbusa's own choices, and I was surprised both that she chose it and that she kept re-reading it. Pretty though it is, I would have glanced through it, seen the near-complete absence of a plot, and assumed that Basbusa would find it boring. 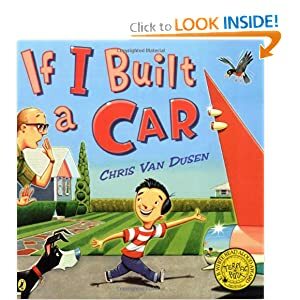 And lastly, just a quick mention of three books that Basbusa really enjoyed: Chris van Dusen's If I Built a Car, and Mo Willems' We Are In A Book! 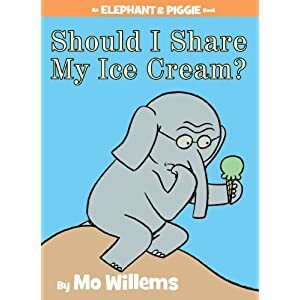 and Should I Share My Ice Cream? I won't go into details, because she enjoyed them for all the same reasons that she enjoyed other books by the same authors, which I have blogged about here. Definitely recommended, though! Especially We Are In A Book. She giggled her way through it a zillion times. I got the form today for reserving Basbusa's place at preschool next year, and much as we both like the school, I think I'll be returning them a "no, thank you"... Insha'Allah we're going to give 'homeschooling' a try next year, and see how it goes. She will only be four, so it's hardly accurate even to call it homeschooling! But I want to try a little tiny bit of formal learning and some semblance of a routine, just to reassure myself that we'll really be able to implement a homeschool lifestyle once Basbusa is old enough for 'real' school. And I also want to reassure other family members that she will, indeed, be learning and not falling behind! So, my plan for next year is just this, insha'Allah: Five days a week, in the morning, we'll do a little bit of Quran memorization (just one line a day would be great, not even one full aya), and work a little bit on Right Start math. That's it. The rest of our 'homeschooling' will just be what we do already: lots of reading and stories, lots of drawing and pretend-writing, lots of time outdoors, trips to fun places, and playdates with other kids. First, regarding the plan itself: is it 'enough'? I think it is, but I keep coming across all these amazing, elaborate pre-K curricula online, and suddenly doubting that I'll be doing enough for Basbusa. I've read blogs of people who follow FIAR and BFIAR, for example, and their kids seem to be enjoying it so much. Whenever I sit down and think hard about whether that would work well for us, I end up deciding that what we're already doing would be better... but what do I know?!? Second, regarding putting the plan into action, I have two more concerns. I'm not sure how to go about setting up the "playdates" part, and that's really the part I care most about. I know there are a billion ways to set up opportunities for Basbusa to interact with other kids, but what I'm really aiming for is opportunities for extended free play with the same group of children on a very regular basis. If I could manage to arrange that two days a week, I'd be totally comfortable with our plan, but I haven't found a way to set it up yet. Almost all of Basbusa's current friends, unfortunately, are leaving the country in a few weeks, and her new friends from preschool will be, unsurprisingly, in preschool. I guess what I'm looking for is a preschool-age homeschool coop, not to far away from here, that involves only a little (or no) structured activities. Hmmm. So I have to work on that, between now and September, insha'Allah. My other worry about implementing this plan is that I'm not sure what I should do if Basbusa isn't thrilled about studying Quran and/or Math. Maybe she won't be interested in the whole idea; maybe she won't like one half of it; maybe she'll be willing to do it one or two days a week but not five. Then what? On the one hand, she'll only be four, so there's no 'need' to do anything formal yet, and I believe very strongly that children's learning should be led by their interests as much as possible. But on the other hand, she is old enough to be doing some Quran, and doing a tiny bit of Quran once or twice a week isn't really enough for anything to "stick." And also, if we don't follow through on this plan, family opposition to homeschooling for Kindergarten will increase dramatically. Hopefully she'll love it, and I know that I won't force the issue if she clearly hates it. But I haven't yet worked out what I think I should do if she falls somewhere in the middle. I'd like to start this post with a request: can anyone recommend a favorite anthology of children's poetry? I'd really appreciate it! I'm looking for poems aimed at the younger end of the spectrum, but not the typical "Mother Goose" collections. (We have those already, and besides, I always feel that many of the traditional nursery rhymes are more than a bit odd when you actually focus on the words...) To give an example of the kind of poem that would be ideal, "There Once Was A Puffin" is Basbusa's current favorite. 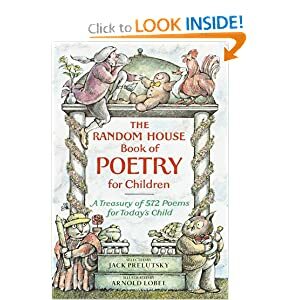 I've been looking for just the right anthology of children's poetry for quite a while, and the Random House Book of Poetry (edited by Jack Prelutsky) is the best I've found so far. 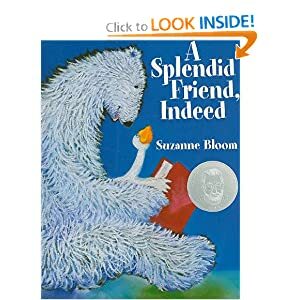 It has a "a collection of 572 poems for today's child," including old classics as well as very modern poems, very long ones and very short ones. We really liked how the poems are grouped by topic, so all the seasons-related ones are together, and all the monster-related ones are together, and so forth. We found some poems that we really loved (Prelutsky's own "The Troll" was one of our favorites), but about half of them were completely over Basbusa's head, and more than another quarter were only vaguely within her grasp. That's not surprising, I suppose, since Basbusa is only three, and this is a collection that would last us throughout childhood for all kinds of children, so I might buy us a copy anyway. My only slight criticism is that the illustrations aren't fantastic, but I suppose you couldn't really include fancy illustrations for so many poems. And besides, as Basbusa gets older, she won't need the pictures anyway. The next book in this week's list is one which we've loved for a long time from the library, but which I was lucky enough to win a copy of from CityKidsHomeschooling! (Thanks, Kerry!) 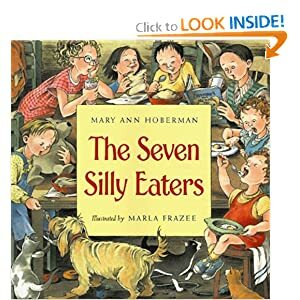 The Seven Silly Eaters has a silly, funny plot - each of the children in this family has his or her own finicky taste regarding food, and as her family grows to seven children, the poor mother grows ever more frazzled trying to cater to them all - but that's only the beginning of why we liked it. 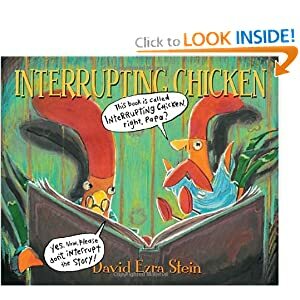 The story is in rhyme, which is always a hit with Basbusa, and the illustrations are wonderful. Basbusa likes watching as the children get older from page to page, and identifying which is which. Plus, their house gradually fills up with all the kind of kid-stuff you would expect with so many children, so there are always interesting conversations to have about which of them probably plays with which toy, and how what the kittens are doing under the table, and so forth. The children eventually stumble over a solution which means their mother no longer has to spend her days cooking seven different kinds of food, so there's a happy ending for all concerned. A truly charming book. 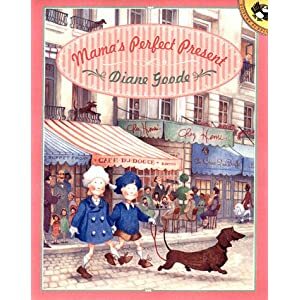 Perfect Soup was an accidental find as we were browsing in a train-station bookstore one day, but it's been a favorite on our shelves for almost a year now. Murray the Mouse discovers, mid-recipe, that he has no carrot to put in his Perfect Soup. 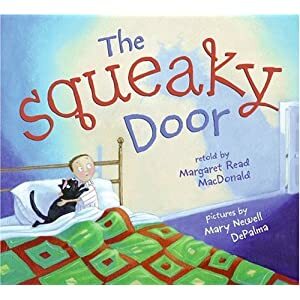 On one level, the rest of the book tells the story of how Murray gets a carrot (by doing an increasingly complex set of trades with a farmer, a horse, a shopkeeper, a boy, and an old lady who likes to knit). This plot-line caught Basbusa's attention from the start, and would have made the book an enjoyable read even without anything else. 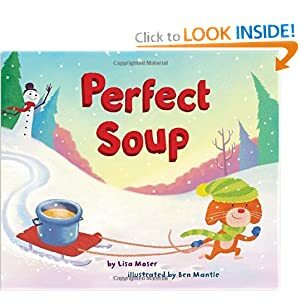 But on another level, a second story is taking place; about how Murray, in his quest for perfection, was at first too busy to make time for friendship, and how, in the end, he realizes that friendship, not a carrot, is the ingredient that truly makes his soup perfect. Add all this to beautiful illustrations showing idyllic winter scenes, and you can see why this is one of our favorites. 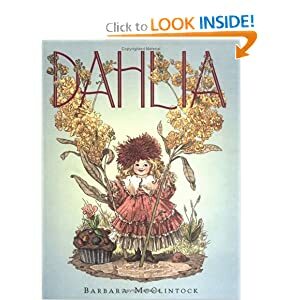 I found Dahlia at Hope Is The Word's list of best picture books. We had to check it out, since we happen to know a very dear little girl with the same name, and I'm so glad we did. Charlotte, the heroine, is a very un-frilly little girl who strongly favors mud-pies over tea-parties. Initially, she reacts to Dahlia, a very frilly new doll, with much ambivalence. But Charlotte eventually comes to love her, and Dahlia comes to love tree-climbing. I thought Charlotte was a wonderful heroine, and I also liked how the lesson of the book went both ways: it is perfectly valid for a little girl to like outdoor exploration more than tea-parties, but it is also perfectly valid to enjoy all those outdoor activities without abandoning frills and ruffles. Plus, Charlotte's day depicted what I would think of as an ideal childhood summer, and the illustrations are lovely. 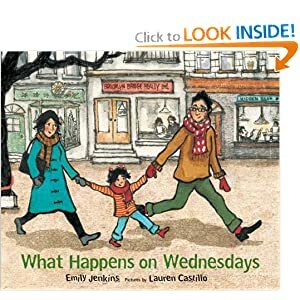 What Happens on Wednesdays is one of Basbusa's own picks from the library, and she loved it. It's just the story of one preschooler's Wednesday, from the time she wakes up until the time she goes to bed, but I think that's why Basbusa liked it so much. 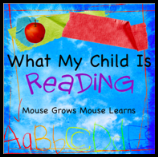 The narration clearly shows a preschooler's love of familiar routines of enjoyable activities, and since Basbusa is right at that stage herself, she loved following along. Plus, this little girl's day is not too different from our own, with trips to the library, the pool, the park, and to preschool, so Basbusa could easily identify with her. First up, two alphabet books. 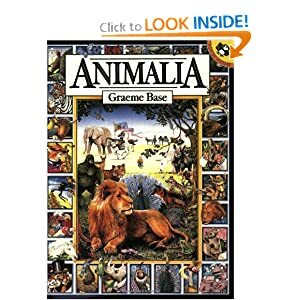 The first one, Animalia, is actually one that Basbusa wasn't all that crazy about. 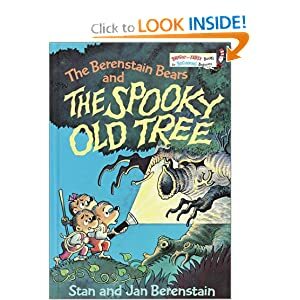 But it's definitely unusual in the alphabet-book category, so I'm blogging it in case someone else has kids who are more interested in seek-and-find books than Basbusa is. The idea is that there's a one- or two-page spread for each letter, each featuring an animal starting with that letter as the main subject of the illustration. There's one sentence about the animal, in which every word also starts with the letter being featured (for example, "An Armored Armadillo Avoiding an Angry Alligator"). I found the sentences themselves a bit obscure, and they quite often used vocabulary that was so far over Basbusa's head that I couldn't easily explain it. But the most interesting part of the book, I thought, was that the illustrations have a huge amount of detail, and the more you look, the more things you find that all start with the letter-of-the-page. In the background of the "P" page about Peacocks, for example, we also found poppies, a parcel, a penguin beside a pond, a parade, the leaning tower of Pisa, just to name a few (there were many more, but they're too small to make out now in the picture I took with my mobile phone!). I thought this was a pretty interesting way of doing things, and the illustrations themselves are attractive enough to spark plenty of interesting discussions... but Basbusa has never been very excited about seek-and-find books, and tended to move on pretty quickly from this one. Oh well. 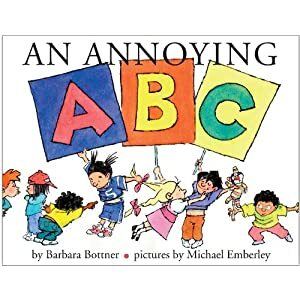 Next up, An Annoying ABC, which is the story of chaos erupting in a preschool classroom. You see, Adelaide annoyed Bailey. Then Bailey blamed Clyde, and Clyde cried... and so on, until Zelda zaps the whole class with the hose she was using to water the flowers. Everyone apologizes, dries off, and then has a quiet afternoon. Basbusa was fascinated by this book because of the social aspects of the plot - I don't think she ever figured out the link to the ABC part of things (oh well, again, but she already knows her letters anyway :). Basbusa recently started preschool herself, and I think the exploration of preschool social dynamics intrigues her. How badly wrong can things really go? And how do people react? And how does it get resolved in the end? 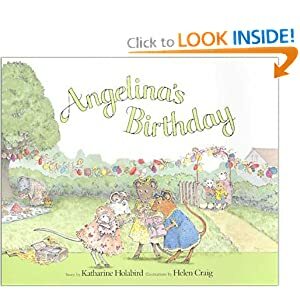 The illustrations show very typical preschoolers doing very typical things, and there's a background plot to follow (of Adelaide trying to recapture the classroom's pet mouse) that also appealed to Basbusa's imagination. And now for two books which Basbusa loved, but which I wasn't so wild about. 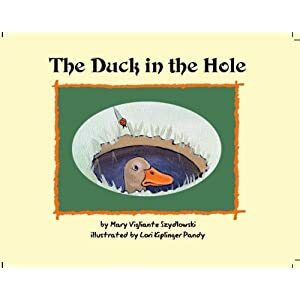 The Duck in the Hole probably isn't a book that I'd ever have picked out for her, but she got a lot out of it. A little girl finds a duck stuck in a hole in her yard, and tries to figure out how to rescue it. A neighborhood dog and cat also begin showing unwelcome interest in the duck, but Keisha eventually figures out a solution that solves the problem. In my opinion - not Basbusa's - the story wasn't very interesting or very believable, and the illustrations were nothing special, but I did like how the girl spontaneously thought through a whole bunch of potential solutions in her imagination, weighing the pros and cons of each one, before deciding what to do. I saw Basbusa mimicking the process a few times, which is a good thing to have picked up! This book also marked a new mini-milestone for us. Each of Keisha's possible choices (and their consequences) were illustrated clearly, and until quite recently, Basbusa wouldn't have been able to grasp that those things didn't actually happen in the plot - they were just showing Keisha's thought-process. I had tried to explain similar issues many times with other books, and Basbusa only half understood me, but this time, she got it all by herself. A Cake All for Me... oh my goodness, A Cake All for Me. One of those books that I was wishing had never been written by the time we could eventually give it back to the library, and which I keep trying to hide behind other books on the shelf when we pass by it in the library again! It's basically a counting book about a pig making a cake. ("One, two, Get out the moo. Three, four, open and pour. Five, six, sift and mix..." etc. We gave this back to the library maybe three months ago now, and I still have it memorized!) 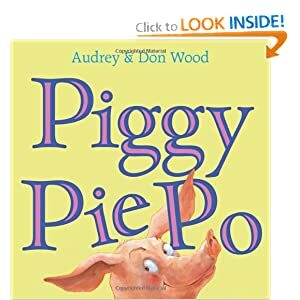 The only other plot is overtly preachy, in my opinion: the pig starts out by wanting to hog the whole cake, even when his hungry friends ask to share it, but then he relents and they all eat it together. Plus I think the animals all have scary-looking teeth. 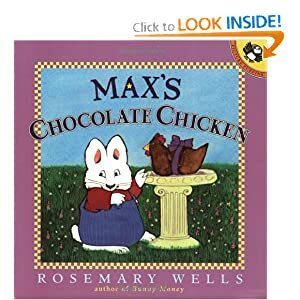 But Basbusa loved this book: we read it approximately forty-two million times, and we still never get the milk out of the fridge without her reciting, "one, two, get out the moo," so here's the recommendation, for what it's worth! There's no real theme to this week's selections - just a bunch of picture books Basbusa has enjoyed recently. 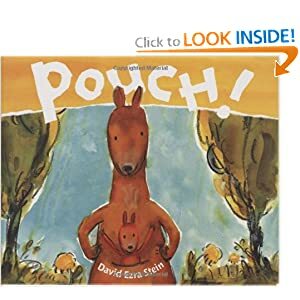 Pouch! is the story of a baby kangaroo's first few trips outside his mother's pouch. 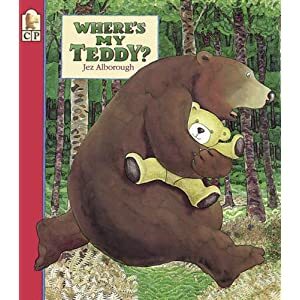 The plot is short and simple, but funny: on his first few tries, the joey is astonished and highly alarmed by his first encounters with ordinary things like a bee or a rabbit, and with a yelp of "Pouch!!" he flees back to safety. But on his fifth trip out, he meets another baby kangaroo. They both yell "Pouch!!" and start to run away, but then realize how similar they are and start giggling. When their mothers come up and ask, "Pouch? ", they happily reply, "No, thanks!" The illustrations are charming, and Basbusa can identify with the joey's hesitant reaction to new experiences! But she likes to point out to him that bees and rabbits aren't scary really, and I think she is interested by his new self-confidence by the end of the book. There are several books in this series by Yoriko Tsutsui, all of them translated from the Japanese. 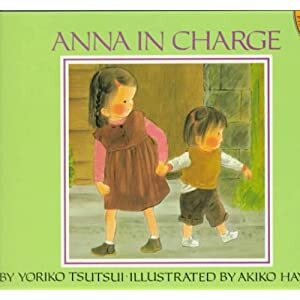 Basbusa's favorite was Anna's Secret Friend, but I couldn't find a picture of it anywhere online, and we also really liked Anna in Charge, pictured here. In Anna's Secret Friend, Anna has just moved to a new town and is a bit lonely, since she doesn't know any other children and her parents are busy unpacking. But then a shy little girl from across the street starts leaving her little gifts in the mailbox - a little bunch of flowers, a folded paper doll - and a note saying she hoped they'd be friends. When they finally meet each other and find the courage to say hello, they really do make friends, and the last scene is of the two of them riding off together on their bikes to flower-filled fields. It's a sweet story, and the mystery of who was leaving the gifts caught Basbusa's interest right from the start. Also, since Basbusa herself tends to need a few moments to gather her courage before joining in a game with new kids, I think she enjoyed seeing other children who felt the same way. And I was glad that she would see an example showing that her approach works out just fine too, in the end! 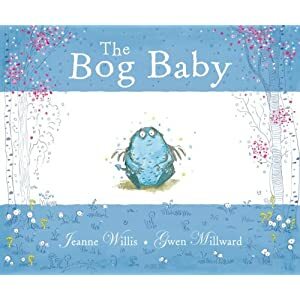 The Bog Baby is the story of how two little girls find a magical creature - a Bog Baby - in a pond in the woods. They take it home and keep it in a bucket in the garage, but despite all their love and attention, it pines away for home. In the end they ask their mother for advice, and she explains that if they truly love their soft blue pet, they have to let him go. Basbusa likes stories involving adventures in the woods, and stories about little baby animals, and anything with a hint of magic about it, so this book was a big hit (and the cover art doesn't do it justice; the illustrations inside are much prettier). It's aimed at a slightly older audience, so there were one or two details she didn't quite get, but we still renewed this one from the library for about two months straight. This week's picks are all non-fiction. We didn't get them all out at the same time - we usually have one or two non-fictions on hand, along with maybe twelve or thirteen fiction books. These are our favorites from the past six months or so. 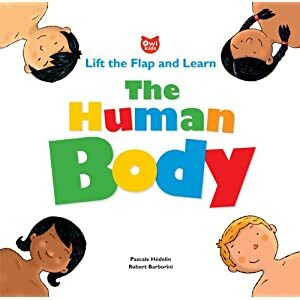 Basbusa has been fascinated by the working of the human body for well over a year now, so I've been trying to make plenty of resources of all kinds available to her. As far as books go, it's been hard to find ones that are anywhere near a three-year-old level, but here are our two favorites so far. 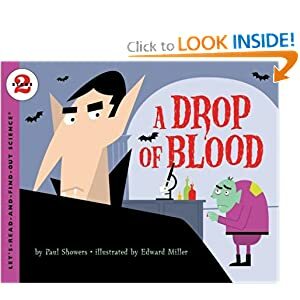 A Drop of Blood is part of the Let's-Read-And-Find-Out Science series. They have a bunch of body- and health-related titles, and we've checked out quite a few of them. They've all gotten a read or two, but this is the only one Basbusa keeps going back to. It's about the circulatory system. There's a little bit too much text for Basbusa, but by skipping a sentence or two on each page, it brings it down to the amount of information that she can handle. She was very interested in the experiment with the flashlight-in-your-mouth, and we went and got a quart container of cream from the fridge to see how much blood she, her little sister, and her dad really have in their bodies (a comparison which the vampire helpfully provides). She was fascinated by the description of how the white blood cells "eat" germs, so we got another book from the library to follow up on that. Next up, some nature books. Basbusa really loved Gran's Bees, which isn't really pure non-fiction. It's pretty close, though - it describes a girl's visit to her grandmother, to help her harvest the honey from her beehives. There's no real plot other than to follow them through the various steps of the process, but Basbusa was intrigued. I was looking for a follow-up book on bees for months afterwards, but it's only now that the summer is over that I finally found The Beautiful Bee Book. This one is straight non-fiction, and just at Basbusa's level, explaining the life-cycle of bees, how they collect pollen and nectar, and how they communicate. 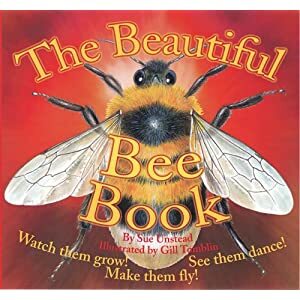 The book's lift-the-flap and pull-the-tab features really do make the content more accessible, rather than just serving as added frills, and there is also a two-page spread showing the most common species of bees you might see around your garden. I think I'm going to hide this one away until next summer, and then re-read it in conjunction with Gran's Bees when there are actually some real bees outside to look at. Gosh, this post has gotten way too long, but just two more quick ones! 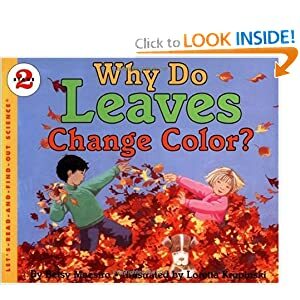 Why Do Leaves Change Color? was a very interesting read for me, and I had thought it would be great for Basbusa. (For example, did you know that the yellow and orange are already present in leaves, but are usually drowned out by all the green? Once the leaves stop producing chlorophyll, you can finally see the other colors that were already there. It's only the red color that is the result of sugar crystallization.) The illustrations were clear and attractive, and most of the information was at Basbusa's level (I skipped over the parts that talked about cell structure in detail). However, on her first read through this one, Basbusa made up her own plot, which was fascinating and very exciting but had nothing whatsoever to do with the science of fall colors. She "re-read" this one a zillion times, elaborating more on her own personal interpretation each time through it, and was 100% against hearing anything about what else the text might have been saying :) So it was certainly a big hit with both of us... even if not for quite the same reasons! 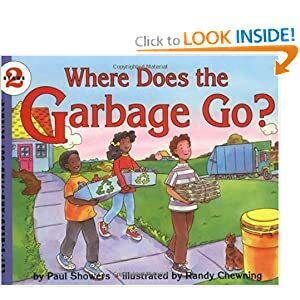 And last up, Where Does the Garbage Go? This one was a little bit dated - it talked as if recycling were quite a recent innovation - but for Basbusa's purposes, it provided very interesting background info surrounding one of her favorite events: the much-anticipated weekly arrival of the garbage trucks :) She was interested to see where they go after they pick up our trash, and she liked examining the illustrations of the big, complicated machines and conveyor belts that recycle the glass, paper and plastic. (I think these machines were largely imaginary rather than being realistic representations of what a recycling plant really looks like, but Basbusa got the idea that old plastic went in and new plastic came out, which is good enough for now.) We've been looking for the triangular-arrows recycling symbol on packages ever since, so it's helped her know where to throw things away too. The following is an excerpt from "The Power of Positive Coaching," part of the New York Time's Fixes series. The Positive Coaching Alliance (PCA) feels that competitiveness and a winning-is-everything approach have become dominant in youth sports, and aims to change that. But the reason I'm quoting this article here is because I think the PCA's way of teaching kids to respond to challenges or disappointments would be a way I think would work well in any setting, sports or otherwise. "Sports psychologists know that athletes who focus on things they can control, as opposed to external factors, are less anxious, more confident, and consequentially, happier and better performers. ... [Jim Thompson, founder of the PCA] came up with the 'ELM Tree of Mastery' to help coaches remember that the feedback that most helps young athletes develop their potential is not praise for good performance or criticism for bad performance. What works best is helping children understand that they control three key variables: their level of Effort, whether they Learn from experiences, and how they respond to Mistakes. ... 'If a child misses a big play, it's a perfect opportunity to talk about resiliency,' explains Thompson. 'I know you're disappointed and I feel bad for you, but the question is what are you going to do now? Are you going to hang your head? Or are you going to bounce back with renewed determination? The single most important thing we do is help coaches teach kids not to be afraid to make mistakes,' he adds." 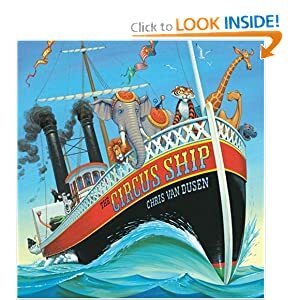 The Circus Ship is one of our all-time favorite books, and has been ever since the first reading. We've loved everything by Chris Van Dusen, as I've mentioned before, but this one is one of the best picture books I've ever read. The basic story is that after a circus ship sinks, the fifteen circus animals end up swimming ashore to an island off the coast of Maine. The astonishment they cause there, and then their plan to avoid being re-captured by the circus boss, are very funny. ("Soon animals were everywhere, and into everything. / 'There's an ostrich in the outhouse!' / 'There's a hippo in the spring!' / 'There's a tiger in the tulips!' / 'There's a lion on the lawn!' / 'There's a python in the pantry!' / It went on and on and on...") But the best bit has to be the circus boss himself, Mr. Paine. He's an arrogant, dictatorial bad-guy who is sooooo much fun to read aloud. "But Mr. Paine, the circus boss, was terribly demanding. / He stomped up to the helm where Captain Carrington was standing, / and screamed, "Don't stop! Keep going! I've got a show to do! / Just get me down to Boston town tomorrow, sir, by two!" He's overblown but only enough to make it fun, not ridiculous (and I love hearing Basbusa's "big mean bad-guy" voice when she says his lines!). The illustrations are great, with lots of little details to discover during re-readings, and Basbusa loves finding the animals hidden in plain sight, to the complete bafflement of Mr. Paine. 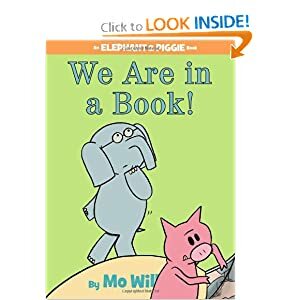 I know that the entire world adores Mo Willems, and indeed Knuffle Bunny was one of the first library books that we renewed so often we ended up buying our own copy. But neither of the sequels quite caught Basbusa's imagination (Knuffle Bunny Free, in particular, went straight over her head). The pigeon books are hit-or-miss (for us - I know most people seem to love them). Basbusa loved The Pigeon Finds a Hot Dog, and we actually had a whole lot of interesting discussions around that one, about why the duckling was asking so many questions, and why the pigeon was getting so annoyed... And it's thanks to Pigeon that "Oh, for Pete's sake!" (plus forehead-slaps) is still part of Basbusa's repertoire ;) But Don't Let the Pigeon Drive the Bus? Nope, not much interest. Hooray for Amanda and her Alligator? So-so. And that Cat-the-cat series just leaves both of us blank. BUT... to get back to the book at hand, Basbusa does like Elephant and Piggie! 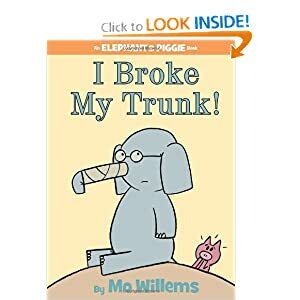 I Broke My Trunk is one of our favorites so far. Gerald breaks his trunk - not by carrying two hippos, a rhino and a piano on it, but by tripping on his way to tell Piggie all about it. And Piggie thinks the story is so funny that she rushes off to tell somebody else... and trips... The text is simple enough that Basbusa can "read" it to herself, and the plot is funny enough to keep her re-reading. 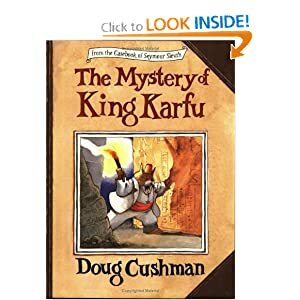 The Mystery of King Karfu is really a bit advanced for Basbusa - she needed quite a bit of help to understand the plot, and the first few times we read it, I just told the story in Arabic rather than reading aloud the English. The book is the story of a food-loving wombat detective named Seymour Sleuth. He is called to Egypt to help an archaeologist friend recover an ancient stone chicken, which has been stolen from the tomb of King Karfu. Rather than the usual text-with-pictures format, this whole book is composed to look like a casebook, with ticket stubs "pasted" in, "photos" of evidence, and Seymour's notes on his interviews with suspects. This was Basbusa's first detective story, and I think probably also the first time she had come across the idea of detectives in general, and she found the concept very interesting. She liked looking for clues (comparing feet to footprints, for example), and she liked the unstated jokes (Seymour Sleuth's 'light snacks', for example, which usually include enough food for a banquet). There were a lot of jokes that she just wasn't old enough for, but which made it fun for me to re-read! I'm not completely sure that she ever 100% got the concept, but she must have gotten the general idea, because she often chose to read it, either with me or "by herself." My Birthday Cake is an easy-reader book, and so far I've found most of them to be tedious beyond belief. This one, though, I'd rate as "not bad," which puts it way ahead of most easy-readers we've seen so far. 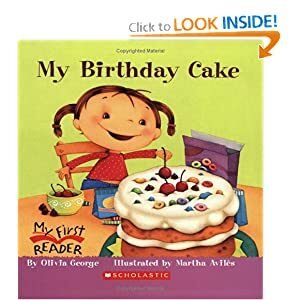 It's a rhyming book about the birthday cake a little girl makes for herself: "My cake will be yummy! My cake will be sweet! My cake will have all the things I like to eat!" And sure enough, it does - candies and donuts and cookies and lollipops and cherries, etc... Basbusa was a big fan of the ingredient list :) In the end, though, she puts on too much blue frosting and ends up preferring the cake her mom has made for her. Not wildly fascinating, but appealing subject-matter for my little sugarcake, and not bad as easy-readers go.